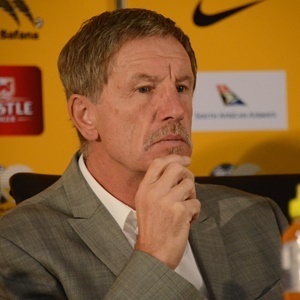 Cape Town - Bafana Bafana coach Stuart Baxter was involved in a heated exchange with journalists at OR Tambo International Airport on Tuesday after suffering a 2-1 defeat to Senegal which brought an end to a disappointing 2018 Soccer World Cup qualifying campaign. Baxter's side finished bottom of Group D, behind eventual winners Senegal, who were followed by Burkina Faso and Cape Verde, respectively. According to a report by TimesLive, the former SuperSport United coach - who has a reputation for having a thin skin - became tetchy when questioned by journalists upon the team's arrival. The 64-year-old coach became involved in a heated exchange with TimesLive journalist Sazi Hadebe after being asked if he intended to vacate his post as national team coach. "You’re the one asking if it’s not a disaster losing four World Cup games‚" he said. "Backpedal. When did I come in? I came in in the middle of a World Cup qualifier (campaign)." Baxter's team selections came in for scrutiny after a strong contingent of SuperSport United players - who he had previously worked with - received call-ups. Also to receive a surprise call-up was 33-year-old Siphiwe Tshabalala, who Baxter once described as Kaizer Chiefs' Lionel Messi, during their time together at the Soweto giants. Baxter pointed to the limited time that he had worked with the squad since being appointed in April while citing the victories over Nigeria and Burkina Faso as an indicator of the team's progress. "I’ve had 40 days working with this squad. I was thrown in the middle of a World Cup qualifier (campaign)‚" he said, before storming off.